This is a two part casement, custom made to exact historic profile, for a Manhattan brownstone. The wood is rift white oak. The rossette was made by us and is close, but not exactly like what had been in the house. Much of the trim and molding we have done can be seen in photographs of cases and doors pictured throughout this site. We have chosen to include some pictures of a few that we feel are special or otherwise significant below. This is a three-part crown molding in a brownstone. The molding was selected and pieced together in this way in an attempt to match the existing plaster molding. All product is from Dykes. Do you now have simple pine doors on your brownstone? 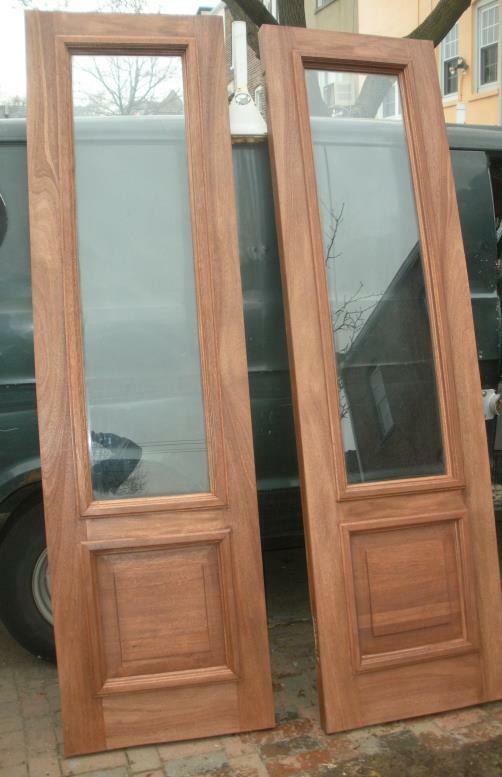 Have you ever wanted a pair of Mahogany or Oak Doors? That is right. For about half the cost of new Mahogany or Oak doors, we will strip and remove all of the rotten wood on your old pine doors and reface them with Mahogany or Quarter/Rift Sawn Oak. 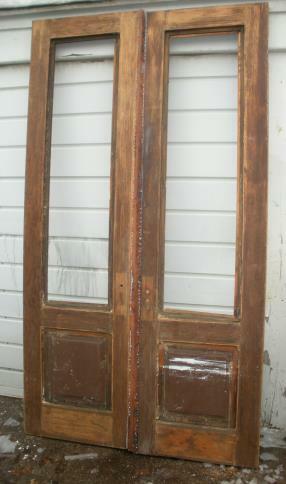 The inset photo shows a pair of typical turn-of-the-century pine doors from Brownstone Brooklyn. We removed the doors, stripped them, and made all of the necessary structural repairs to them using pine and epoxy. The larger picture shows the very same doors, with a new 1/4" thick mahogany veneer, solid edges, new raised, solid wood panels, new safety glass, and custom mahogany trim. These doors were later finished with Mohawk Walnut Stain and General Finishes Exterior 450 Topcoat and installed in the brownstone from which they came, with new astragals, a Multilock Deadbolt and a Marks Mortise lock set. At 2.25" thick, these doors are now quite substantial. All of this was done for about 1/2 the price of new doors! Many do not know this, but most doors that appear to be solid oak or mahogany are really made of pine "staves" glued up and faced with a 1/4" thick layer of oak or mahogany. This method of construction is less likely to split or warp. One of the reasons the facing on doors sometimes comes loose is because the original adhesive may have been too hard and resistant to the natural expansion and contraction of the wood, especially across the grain, thereby cracking. it is our feeling that modern pva glue may fail in this way. For this reason, all of our wood facings are attached using West System G Flex Epoxy. G Flex is made for use in wood boats - which we know pound over waves - and offers just enough give so the wood can move without breaking apart. This epoxy is expensive but we have decided that the cost is justified.